Pros and Cons puts matters in a way I like: Whimsical on the surface, darker inside. It’s a good starting point for today’s post. The face you present to a jury and the face your friends and relations see might be an extreme example, but much in your life depends, I think, on the distance between the face you present to the world and the face you know yourself. “Know thyself” is a potentially fathomless depth at the center of most philosophies and religions. The current fad, judging from social media, being to declare yourself an introvert, a logical fail since a true introvert wouldn’t post on social media. It reminds me of James Randi’s trick, in which he hands out envelopes to a group telling them that the contents are a personal astrological profile based on their date, time and place of birth, and asks how many think it’s accurate. After most hands go up, he has them exchange these profiles, revealing that they are identical. We’re all a bit self-conscious and insecure. Some of us retreat inwardly, and some over-compensate with babble and bluster, but we’re all “introverts” until you pinpoint a place on the scale where normal self-consciousness goes past the norm. Even then, there’s a long stretch of “so what” before it becomes remarkable. 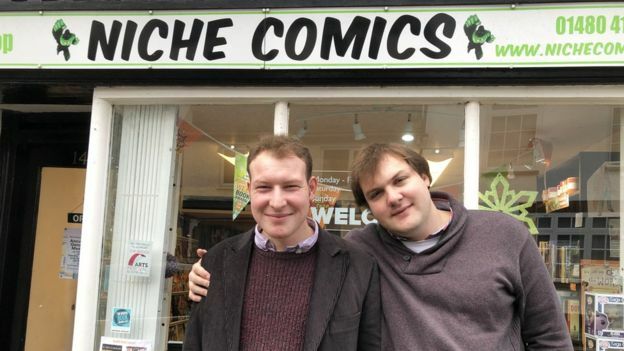 Which might make you wonder when I’m going to get around to some comics, but here’s a delightful story (hat tip to Tom Spurgeon) about a pair of autistic brothers who have opened a comics store. I don’t mean “delightful” in what, in the disability community, is known as a “Supercrip” story, about the quadriplegic who climbs Mount Everest and (sniff, sob) isn’t he just so noble and courageous? I’m delighted anytime someone finds the right niche, and, when it’s somebody who is hard to fit, it’s that much more rewarding. And, relative to comics, I love the way these fellows explain their interest in comics and superheroes and how that fits into the world of autism, because it does show both the light and dark side of that match. For them, it means not only finding a pleasant place but being able to share their joy and expertise with others. Depending on where you sit on the autism scale, that can be a rare outcome. Further down that scale, it may also explain the extremes of the comics world, including the irrational fury of Comicsgate/Gamergate trolls, who respond out of all proportion to any challenge to the pillars of their private universe. I say this with regret and affection, because I’ve known a lot of Aspies and the ones who are self-aware are very nice people and the ones who aren’t can be impossible. 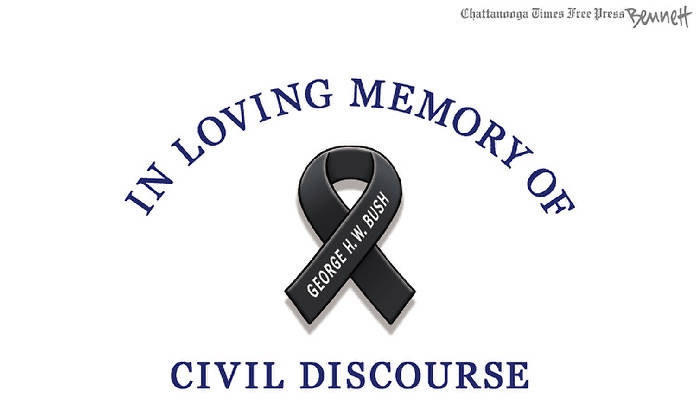 Clay Bennett makes a neutral statement about Bush’s presidency itself, but a positive statement about his personal influence on the national mood, and that’s echoed in Luckovich’s piece, which memorializes the fact that Bush knew he was imperfect and was a great deal more comfortable with it than is his current successor. 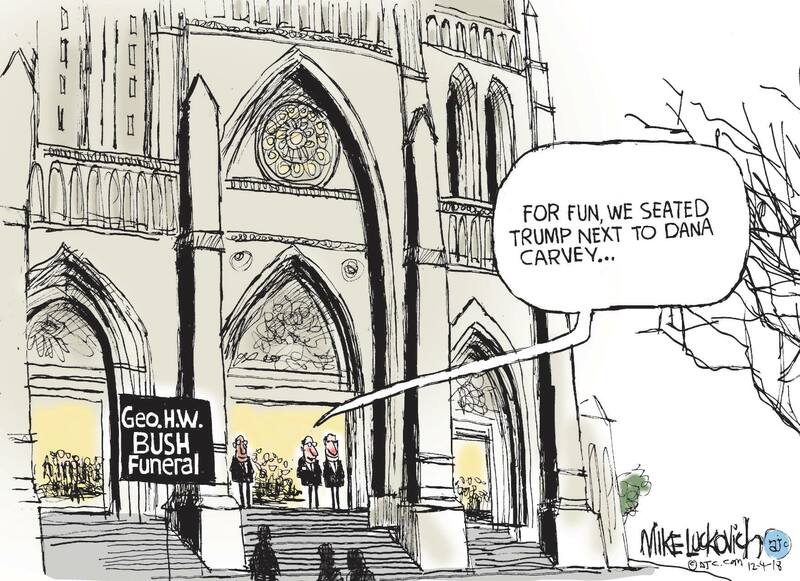 It takes more than being a good sport to be a great president, but at least GHWB was a good sport. As for where I fall on that autism scale, I’m sorry he’s dead, but, on the other hand, he was 94 years old and had had several close calls and hospitalizations and so I don’t find it particularly shocking. Moreover, my impatience with the prolonged TV coverage is probably a personal thing, since apparently most people want and appreciate it. I’m more concerned with the people — cartoonists but also regular folks — who are furiously expressing rage over some things that happened on his watch, or some that should have but didn’t. There is, to start with, the basic social convention of speaking only good of the dead, and the “brought up in a barn” factor should come in somewhere. It’s a factor in my wondering — with no disrespect for free speech — whether this fury is somehow another example of people being triggered beyond that median point on the empathy/autism scale. History will judge him, but, like all good judges, it should do so with proof and logic, not emotions. As for me, I’m currently on my one-dozenth president and have not seen a perfect one yet. Point being that, if you’re going to go over the top batshit about what GHWB did or didn’t do, I sure don’t want to be in the room when some of those more influential fellas kick the bucket. Michael de Adder explains the agreement Canada and Mexico are calling the “new NAFTA” and which I guess Dear Leader is calling the United States Marine Corps Academy. I covered the FTA in the late 80s, when we were establishing free trade with a nation that could in several ways be compared to California. There were issues over softwood and potash, but the main barrier was the existing auto pact, which allowed auto companies to seamlessly operate factories on both sides of the border. The resolution was, in effect, to sidestep it because there were bigger fish to fry. Bringing in Mexico a few years later was potentially harder because it isn’t at all like California, but, by then, free-trade hardliners were in the driver’s seat. This new thing is supposed to have it all worked out, though FTA and NAFTA were also supposed to have everything all worked out. 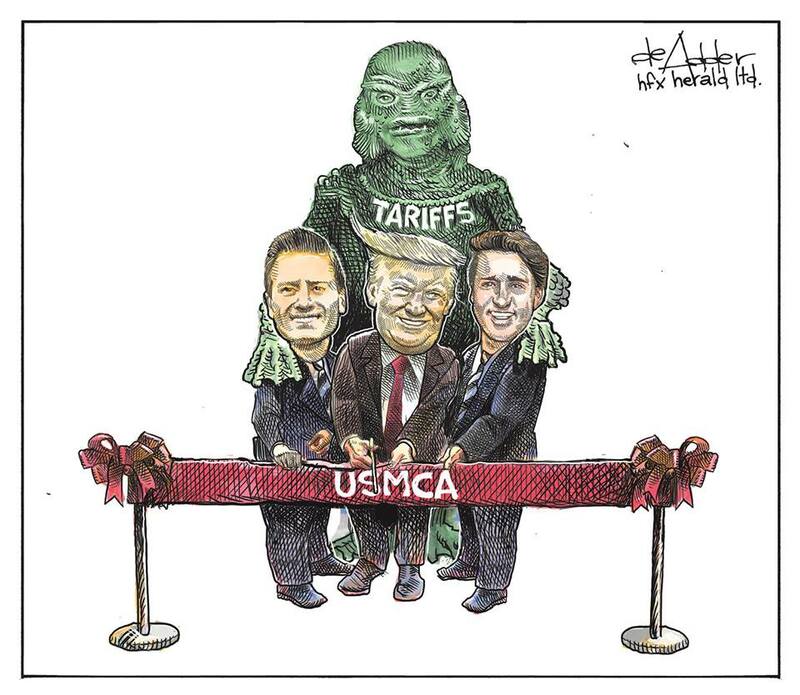 Still, while I haven’t followed the details, like de Adder, I’m pretty sure tariffs don’t belong in the congratulatory photo. It’s been said that when the FTA was passed, some members of Congress cheered because it meant all those jobs would leave Canada, and the Great White North would just become another market to dump cheap US goods into. Then Mexico entered the thing, and those same congressmen/women complained mightily that all those jobs were now moving south and this was terrible and the US was just another place to dump cheap Mexican goods. I wonder if they ever got the irony of it all. That said, the intent of NAFTA was to create a completely tariff-free zone within fifteen years of signing. That never happened, of course, because too much money was at stake, but another piece of bemusing trivia: the very first thing to be declared tariff-free under NAFTA was Harley Davidson motorcycles.